Bernie Sanders Wants Medicare-For-All. But There's A Plan B : Shots - Health News "Medicare for America" would stop short of a full-blown expansion of Medicare. It would include copays from patients and a role for insurers. Could it survive health care's politics? 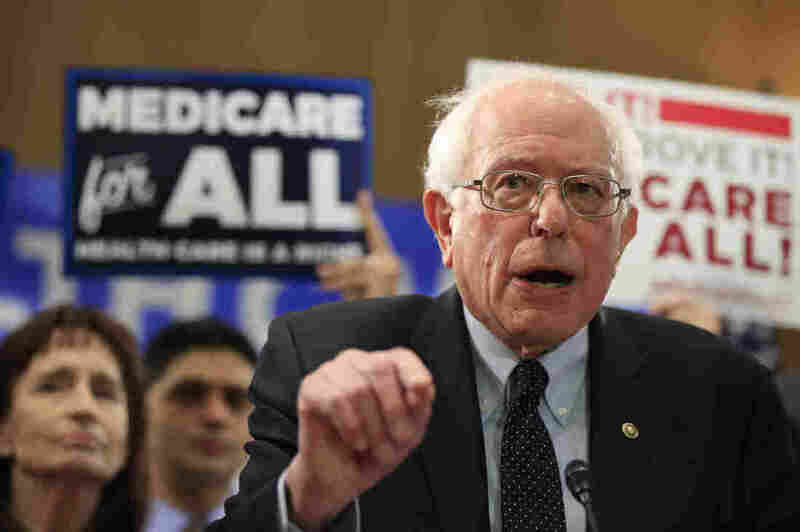 Sen. Bernie Sanders, I-Vt., introduced the Medicare for All Act of 2019 on Capitol Hill Wednesday. As with its previous iterations, Sanders' latest bill would establish a national, single-payer Medicare system with vastly expanded benefits. Sanders' plan would also prohibit private plans from competing with Medicare and would eliminate cost-sharing. New in this version is a universal provision for long-term care in home and community settings (though Medicaid would continue to cover institutional care, and states would determine the standard of eligibility). Already, it has an impressive list of Senate co-sponsors — including some of Sanders' rivals for the Democratic presidential nomination: Cory Booker of New Jersey, Kirsten Gillibrand of New York, Kamala Harris of California and Elizabeth Warren of Massachusetts. But many of the candidates — even official "Medicare-for-all" co-sponsors — are at the same time edging toward a more incremental approach, called "Medicare for America." Proponents argue it could deliver better health care to all Americans while avoiding political, budgetary and legal objections. This movement to embrace a more incremental policy comes as politicians tread carefully over the political land mines a "Medicare-for-all" endorsement could unleash, while seeking to capitalize on voters' growing appetite for health overhaul. During the 2018 midterm election campaigns, some congressional candidates talked about allowing younger people — anyone older than 55 — to join Medicare or allowing people younger than 65 to buy into it if they choose (what's come to be called the public option). Many candidates aren't eager to face the industry opposition a full-on Medicare expansion would surely trigger. From the consumer perspective, a sweeping overhaul poses a risk. Despite Medicare's popularity with its beneficiaries, the majority of Americans express satisfaction with their health care, and many are nervous about giving up private options. Also, many analysts are worried that a generous "Medicare-for-all" plan that promises everything would break the bank if it didn't include copayments from patients. That tension is pushing a number of candidates toward an option that has come to be called Medicare for America. The bill was introduced last December with little fanfare by two Democrats — Rep. Rosa DeLauro of Connecticut and Rep. Jan Schakowsky of Illinois. It hasn't been reintroduced in the new Congress. This proposed system would guarantee universal coverage, but leave job-based insurance available for those who want it. Unlike "Medicare-for-all," though, it would preserve premiums and deductibles, so beneficiaries would still have to pay some costs out-of-pocket. The bill would allow private insurers to operate Medicare plans as well — a system called Medicare Advantage, which covers about a third of the program's beneficiaries currently and which would be outlawed under "Medicare-for-all." "Before policies get defined, what you see is people endorsing a plan that is a little, perhaps, less subject to early attack," says Celinda Lake, a Democratic pollster with Lake Research Partners. "A lot of candidates feel if they endorse a plan that leaves some private insurance, they get more time to say what their ideas are about." "Medicare for America" got its first high-profile endorsement from former Texas Rep. Beto O'Rourke, who launched his own 2020 bid for president in mid-March. Other candidates — including Warren, Gillibrand and Pete Buttigieg, the mayor of South Bend, Ind. — have tiptoed toward that policy without making any endorsements, suggesting they back "Medicare-for-all" in theory but also support a system that retains private insurance, at least temporarily. Such an approach is perhaps unsurprising. Recent polling indicates voters want strong health care improvement. And candidates need something powerful to deliver, election analysts say. Simply improving the Affordable Care Act — an idea backed by Sen. Amy Klobuchar, a Minnesota Democrat running in the primary's moderate lane — may not suffice. "The ACA is popular at the 50 percent level, but it's not energetic," says Robert Blendon, a political analyst at the Harvard T.H. Chan School of Public Health. "It doesn't get people who really like it. What they're looking for is something that is exciting but isn't threatening." Both "Medicare-for-all" and "Medicare for America," pollsters note, offer something that presidential candidates can campaign on — a health care alternative that, at first blush, sounds appealing to many. But the latter proposal might more easily skirt some potential obstacles. In polls, approval for the concept of "Medicare-for-all" drops when people learn that under such a program, they would very likely lose their current health plan (even if the government-offered plan could theoretically provide more generous coverage). This also tracks with recent polling suggesting that while "Medicare-for-all" support can be swayed, voters of all political stripes favor some way to extend optional Medicare coverage, without necessarily eliminating the private industry altogether. Employers would either have to offer plans that were at least as generous as the government program or send their employees to Medicare. And employers who stop offering health benefits would have to pay a Medicare payroll tax. For now, most candidates are still avoiding a concrete stance on the "Medicare for America" plan. Despite signs of interest, the Buttigieg, Gillibrand and Warren campaigns have all declined to directly answer questions about whether they endorse "Medicare for America." The campaigns of other candidates in the race — Harris, Klobuchar, Booker, former Housing and Urban Development Secretary Julián Castro and Washington Gov. Jay Inslee — similarly declined to comment. Reading between the lines, though, their promises to achieve universal health care by expanding Medicare — while retaining private insurance — leave them few options aside from something like "Medicare for America," argues Jacob Hacker, a political scientist at Yale University and one the proposal's main architects. "There are variations besides this particular plan, but once you start to actually dig into this, if you want universal coverage you're going to have to do the kinds of things" spelled out in "Medicare for America," Hacker says. Still, though, the plan Hacker helped design has prompted objections from both the left and the right. On the far left, the cost-sharing component is a dominant concern. (Under "Medicare for America," an individual would have a $3,500 out-of-pocket annual limit; a family would have a $5,000 limit. Premiums would be capped at almost 10 percent of a household's income.) Critics on the left also say the plan's accommodations to private insurance limit the government's ability to negotiate lower prices. Meanwhile, conservatives repeat many of the arguments levied against "Medicare-for-all" — that the plan is too expensive, too disruptive. Political analysts predict that contributors to the health care industry who have already mobilized against "Medicare-for-all" — including hospitals, insurers, drugmakers and many doctors — also can be expected to make a strong showing against "Medicare for America." More Medicare means less revenue for the medical industry. "The fact of expanded Medicare will be the focus of attacks," says the Commonweath Fund's David Blumenthal.